"There is no Planet B, open your eyes and see"
King Gizzard & The Lizard Wizard are one of the most versatile bands out there, meshing psychedelic weirdness with pummeling heavy metal. Listen to their new song, "Planet B," and check out the music video above on YouTube. The video opens with almost forty seconds of the band laughing and barking, dressed in matching orange outfits. Rapid drums and feedback set the stage for headbanging riffs that seem at odds with the pastoral landscape and the band's carefree smiles. From this point on, the song intensifies with shredding guitars and menacing vocals that include the refrain, "There is no Planet B. Open your eyes and see." Spoiler alert: The music video gets extremely violent. 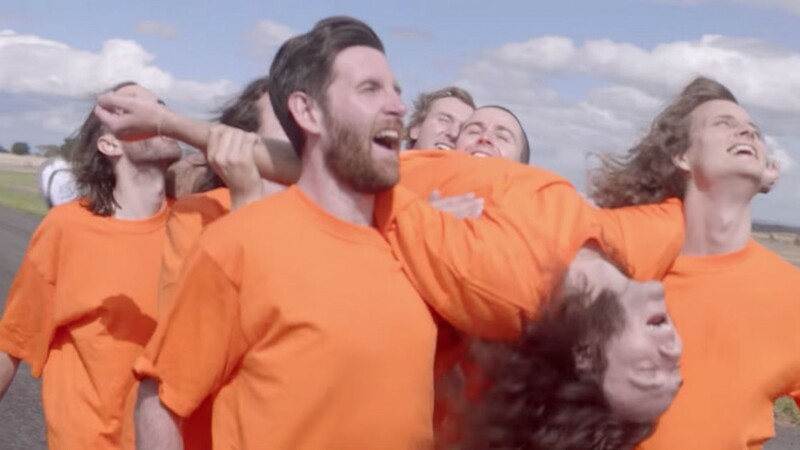 King Gizzard will release a new album titled Fishing For Fishies on April 26, 2019. Pick it up on Amazon. "Planet B" is the fourth song released, following "Cyboogie," "Fishing for Fishies," and "Boogieman Sam." The band will head out on a North American tour in August. For concert tickets and more, check out the King Gizzard & The Lizard Wizard Zumic artist page.